If you've been thinking about a new marketing plan for your business, or have been exploring digital marketing options – then you’ve probably come across a few of these terms along the way. And with that, you may have felt confused as to what some of them mean! That’s why our iQuest team created this go-to marketing glossary for any business owner that’s ready to become a marketing pro. Also known as Split Testing, A/B Testing is used to compare two different versions of a web page or app to assess which of the two performs better, to ultimately improve the conversion rate (or percentage of users who perform your desired action). The base is the "A" while the variant is the "B" in the term "A/B". Used traditionally to reference the front page of a newspaper, it is now more commonly used for websites. “Above the fold” describes content displayed on a visitor’s screen when they first visit the website, and before they scroll down. The “fold” is the bottom of the visitors’ screen, so anything below that will not be visible when the visitor first visits the website. Where the fold is located depends on the device used. A computer monitor, a laptop or a smart phone all have different screen sizes, so the fold would be in different places. Our job as website designers is to ensure the most important information is displayed above the fold, which typically explains the main product or service being offered. will typically leave for another website. Improving your bounce rate means keeping visitors on your website longer, or long enough to read your content. The Click-Through-Rate (CTR) indicates how well an online ad captures an audience’s interest. Therefore, the higher the CTR, the more successful the ad is. We use CTR as a primary indicator when we run Google Ads. The CPC or Cost-Per-Click represents the cost each time a user clicks your online ad. Ad channels like Google Ads (AdWords) generally charge per click, and Facebook Ads includes it as an option. 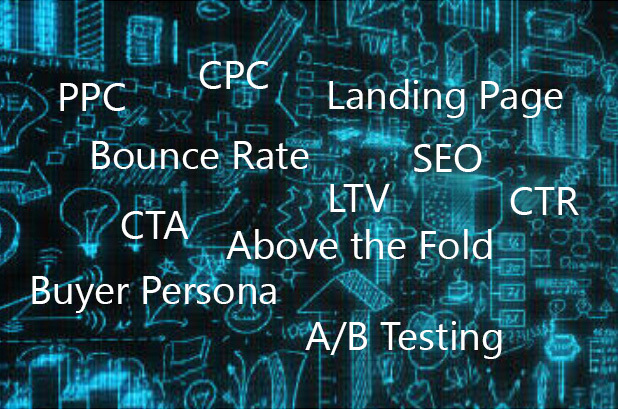 CPC is a smart and popular marketing option because it’s results-based. With every click, there’s a chance for conversion. The CPI or Cost-Per-Impression represents the cost each time your ad appears on a site, not taking into account whether the user actually notices it or chooses to interact with it. A Drip Campaigns consists of a series of sales messages, typically via e-mail, sent out to prospective customers usually after an event or a conversion (for example: signing up for a free trial). These messages follow a set schedule and are sent with the purpose of driving the potential customer to complete a desired action. The landing page is a standalone webpage created with a company’s specific marketing campaign in mind, and is the first page a user sees after they’ve clicked on a Google search result ad, a social post, or similar. Every landing page should have a CTA, or Call-to-Action. We use CTAs (Call-to-Action) in marketing campaigns to get users to take a desired action. A CTA can be in the form of a graphic, a button, or even a simple text link. Different types of CTAs range from asking your visitor to fill out information to receive an offer, asking them to sign up for a newsletter or free trial, asking them to share on social media, inviting them to attend a webinar – the list goes on. The LTV is the Life Time Value of a customer, or essentially, the amount you expect your customers to pay you in total. For example, if they’re subscribed to a $50/month service and stay for a year, their LTV would be $600. PPC, or Pay-Per-Click is a method of purchasing visits to your website, where the marketer will pay a fee every time one of their ads is clicked. One of the most common forms of PPC is search engine marketing or SEM. SEM (Search Engine Marketing) SEM, or Search Engine Marketing, describes marketing through paid advertisements that are displayed on search engine results pages. Companies will bid on trending keywords to help their ad place higher up in Google search results. Retargeting describes the method of reaching out to the website visitors who landed on your company website, but did not follow through with your desired call to action (CTA) – such as making a purchase, completing a form or downloading an e-book). This is typically done through targeted advertising to these past visitors based on cookies. Remarketing, on the other hand, involves collecting information about potential customers from which lists are then created to send sales emails. Search Engine Optimization (SEO) is an ongoing effort to increase organic traffic and improve the ranking of your website through search engine results. A Buyer Persona is essentially a persona created by you or a marketing team to describe traits about your company’s average customer or target individual. This includes important demographic and psychographic information such as age range, gender, hobbies and behaviors, educational background, career, marital status, and more. Quite a bit of research is needed to create the right buyer persona, but it’s a critical piece to your marketing plan as you’ll want to make sure you’re targeting the right potential customers. And it certainly doesn’t hurt to get to know the lingo. If ever you need assistance creating a successful marketing plan or campaign for your business, the experts at iQuest Media can help! Contact our digital marketing team today and let’s talk about how we can enhance your presence online, and ultimately boost sales.